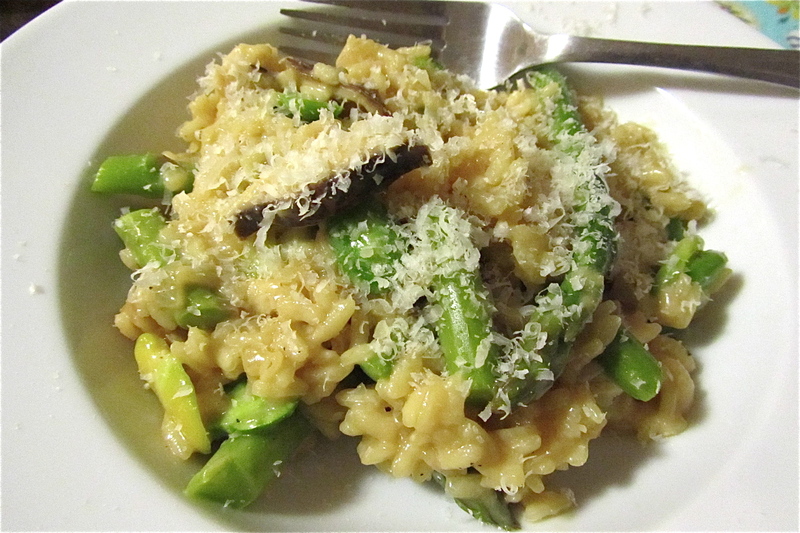 The last time I had risotto was about eight years ago. I was somewhere in France with my mom and brother, and we found this cute little restaurant with dark wooden booths and dim lighting. I ordered a dish of mushroom risotto, and it was so incredibly rich that I was overwhelmed in just a few bites! I enjoyed what I ate it, but was left with the impression that risottos are rich and heavy and didn’t feel the need to order any for several years following. That all changed during a luncheon at work. 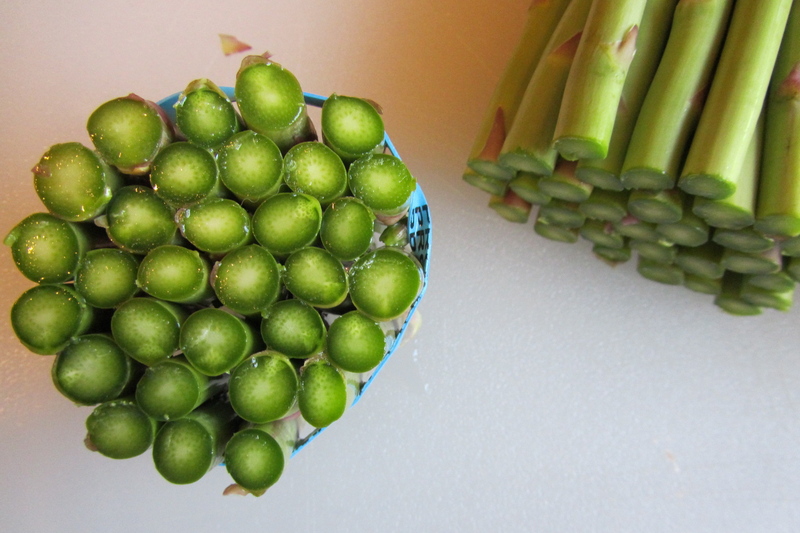 The Chefs made a spring pea risotto with fresh peas, pea shoots, and Creme Fraiche. The following weekend for lunch, our Sous Chef, Treaver, made a carrot risotto that tasted like the freshest carrots ever. After those two amazing risottos, I became temporarily obsessed and knew I needed to figure out how to make risotto on my own! My boyfriend Tim is fabulous, because he makes me try new food all the time. 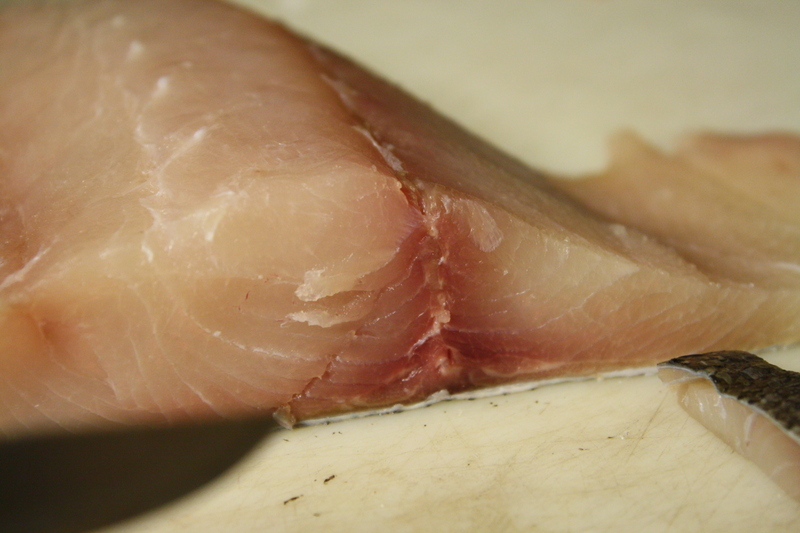 This past Saturday, he stopped at Pier 46 and came back with Hiramasa Kingfish, which I had never heard of before. Whenever Tim surprises me with something new, I worry I’m not going to like it and starve. Please note that this hasn’t ever happened…haha. Fortunately, Hiramasa wasn’t just good, it was incredible! 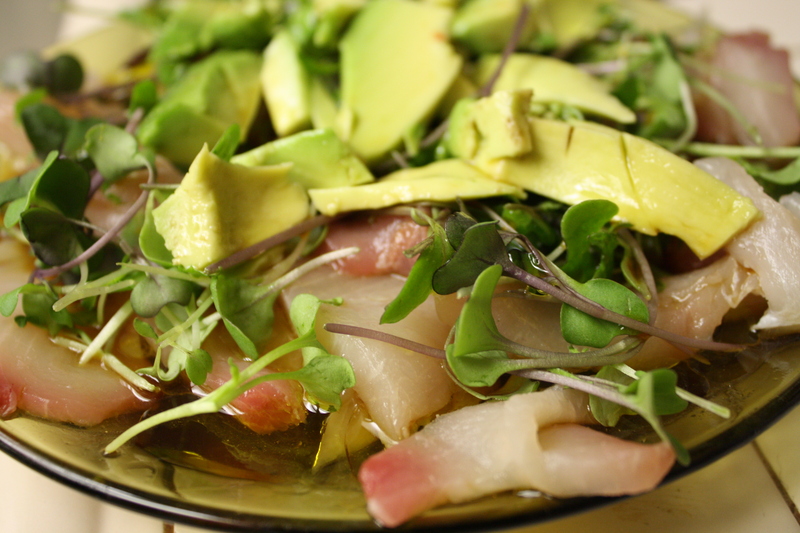 Tim was going to barbeque it, but after an incredibly busy day at the winery, we were beat so he made it sashimi style. Hiramasa is an Australian fish that, according to the Internets, is even higher in Omega-3’s than salmon (which is great, because I hate salmon. I know, what’s wrong with me?!). 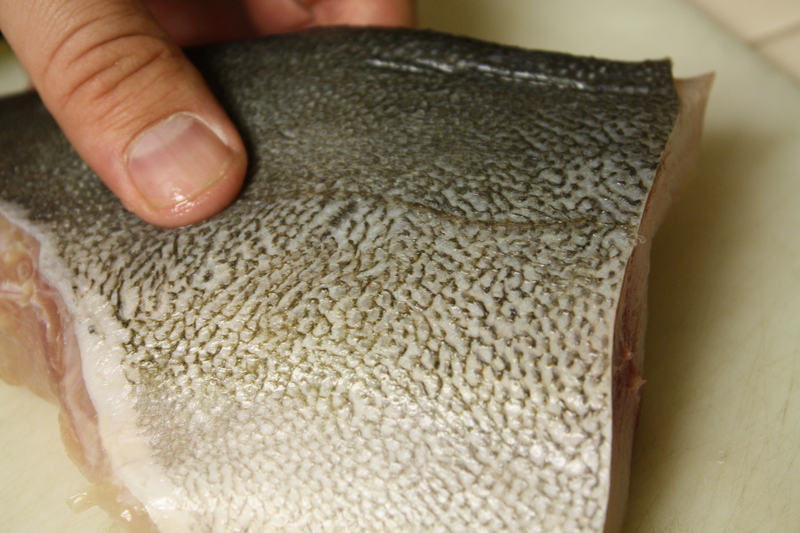 The fish was incredibly clean tasting with a perfect firm texture. It was SUCH a treat! I loved it! This past week was incredible! I took my first long solo drive (four hours to Sacramento) to stand beside my best friend as she got married on Saturday (I was the Maid of Honor!). The wedding took place at Rock-n-Water in Coloma, California, where Heidi and Kyle met in 2004. It was the most beautiful place for a wedding! The weather was perfect, Heidi looked beautiful, she and Kyle were so happy and adorable, Tim was able to come and he looked incredibly handsome, and I cried during my entire Maid of Honor speech. I LOVE weddings! Wow. Unfortunately, upon returning home I came down with the worst fever I’ve had since I was a little kid. 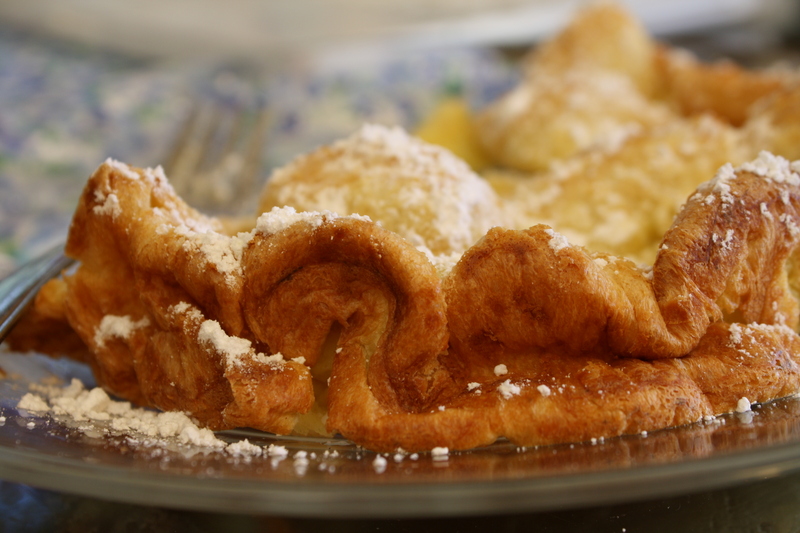 I was out of commission on Monday, but on Tuesday I managed to drag myself out of bed to throw these German Pancakes together (following which I crashed right back into bed). 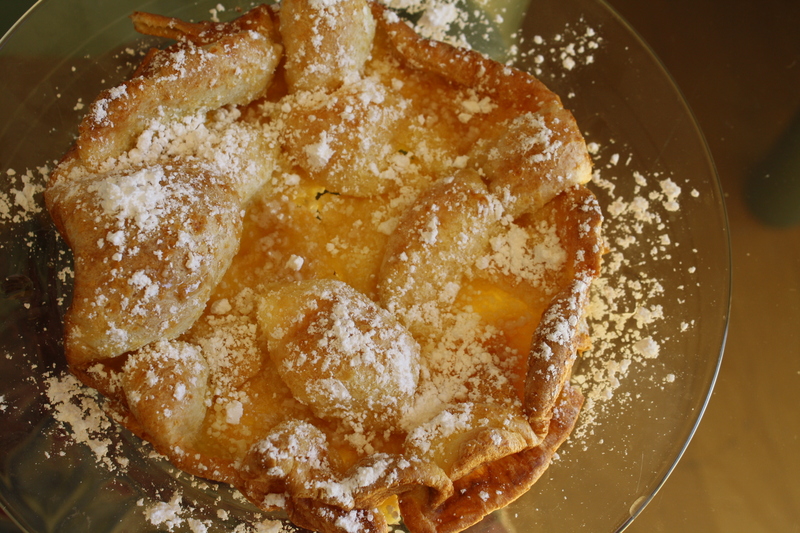 Also known as Dutch Babies, these are like a cross between a crepe, a popover, and a pancake. 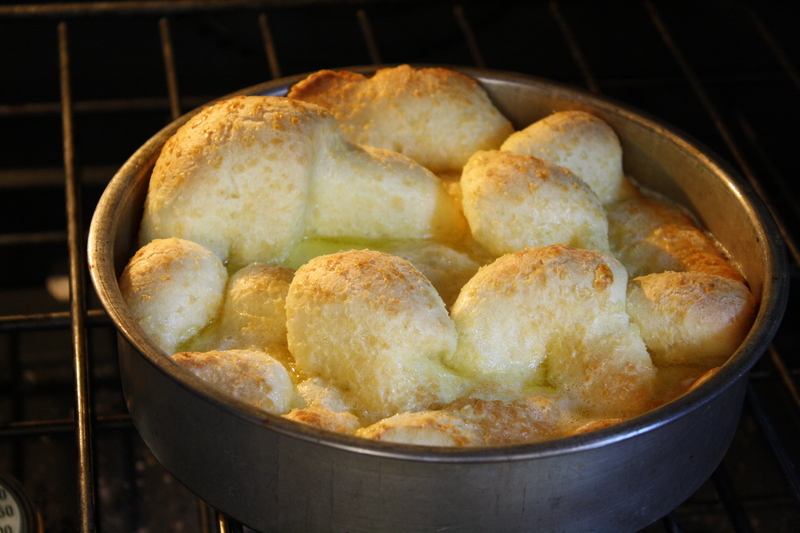 They puff up beautifully in the oven and are so much fun to cook! I loved them so much I made them again on Wednesday before work. You can watch them bubble up in the oven, and they deflate slightly when you take them out. With my mom out of town and my tasting room employees on spring break, I had a crazy-busy week among the feeding of the animals, the watering of the plants, and the extra hours at work. On Friday night, all I wanted to do was veg out and eat something comforting…sometimes, you just feel like a bowl of noodles. 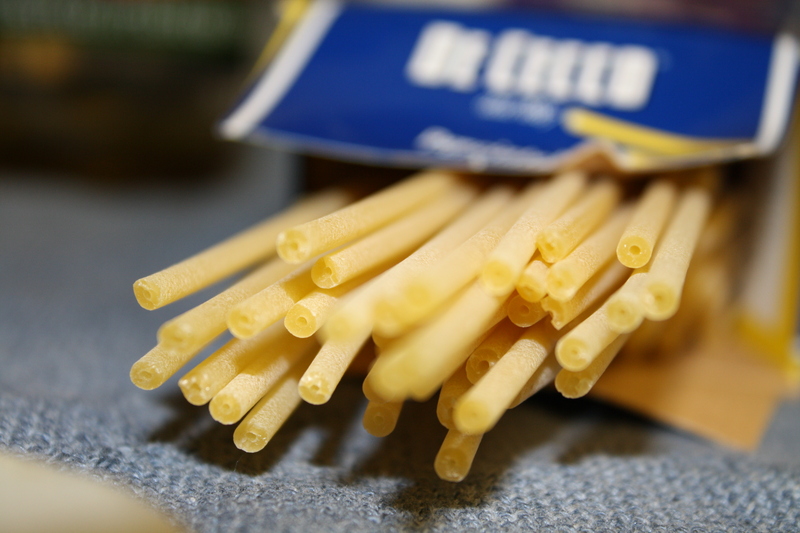 Perciatelli is a thick spaghetti-like pasta shape that has a hole in the center – it’s like a spaghetti tube. 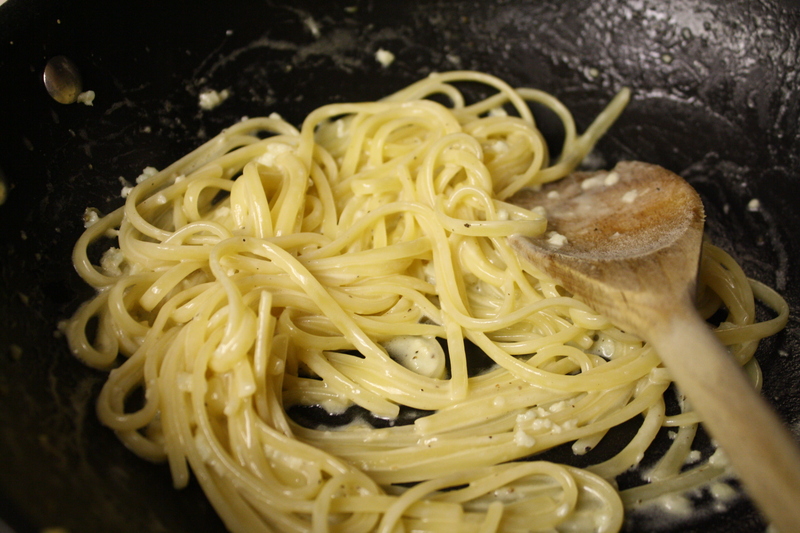 Even when al dente, it doesn’t twirl because it’s so thick. I broke the noodles in half for this recipe, which made it a dantier dish. 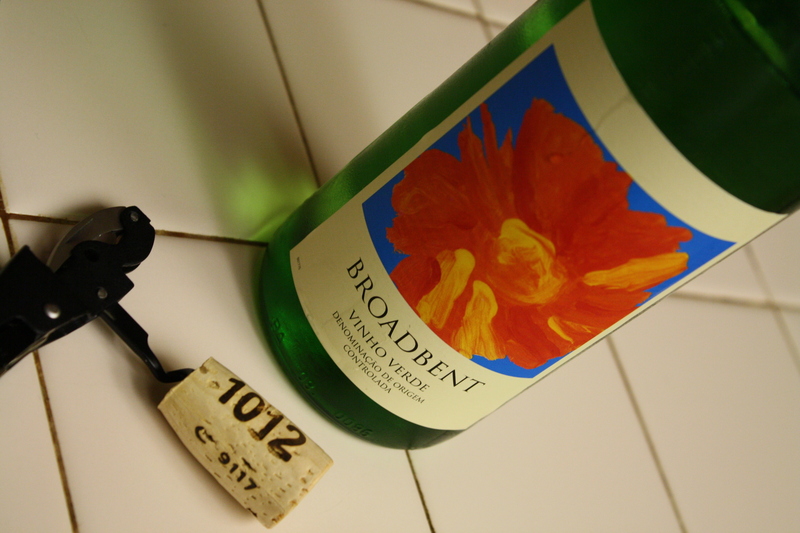 And of course, what’s a meal without the perfect wine and cheese pairing? 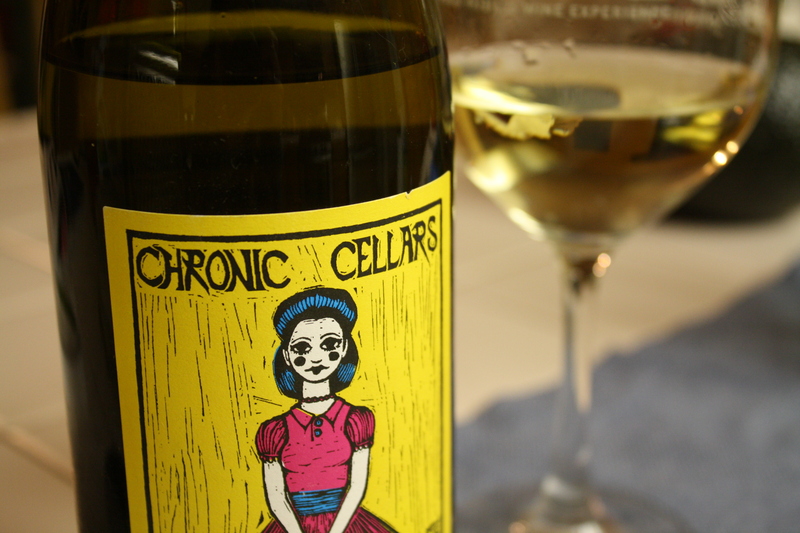 The other night, I had a bottle of Chronic Cellars (one of my FAVORITE wineries) 2007 La Muneca, which is 50% Roussanne and 50% Viogner, chilling in the fridge. I picked up a hunk of parmigiano reggiano from the cheese side of the operation (The operation being my place of work, Vivant Fine Cheese), headed home, and threw together this delicious dinner. My mom went to San Francisco to visit my brother last week, and she brought home some amaaaazing fresh pasta that she got in the Ferry Building. 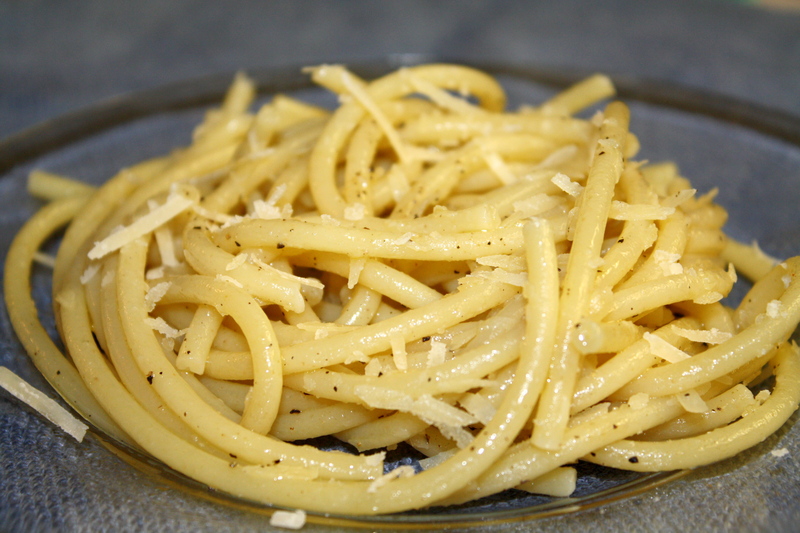 When I get my hands on really nice pasta, I like to do something simple with it, usually just olive oil and parmesan. 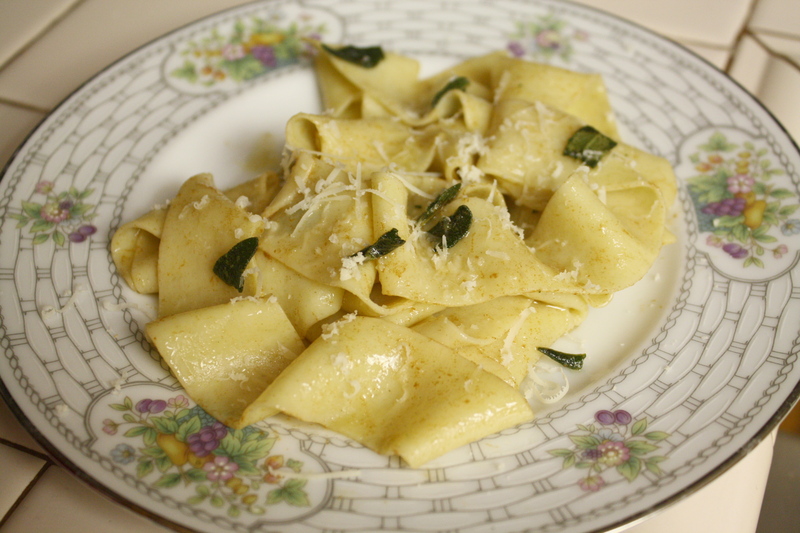 Last night, I decided to step outside of my comfort zone and try a brown butter sage sauce…and it came out beautifully! I didn’t really get this recipe from any one place, I’ve just read about how to make it many times. It’s simple; just brown the butter and add the sage! It seems a little scary, because everyone’s like, “Don’t burn the butter!! !” As long as you keep your flame low, you should be fine….and if you do burn it, it’s just a few tablespoons of butter and you can start over! 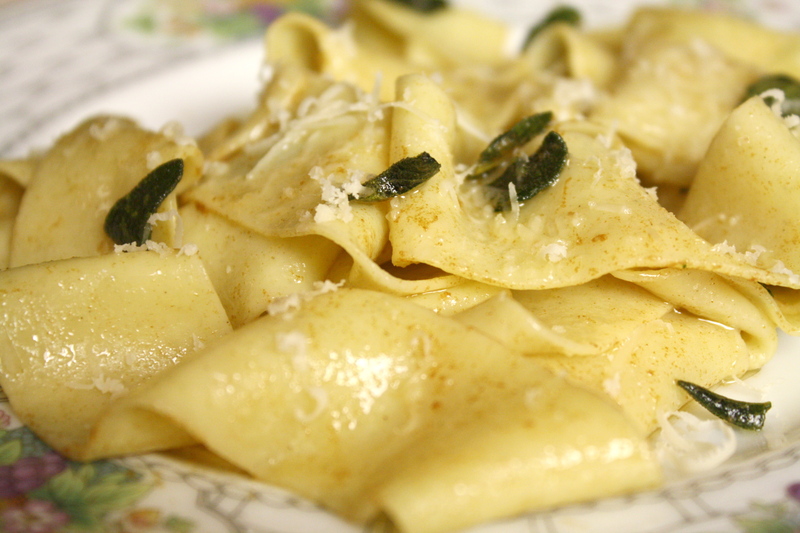 I see brown butter and sage sauce a lot with gnocchi or butternut squash ravioli. 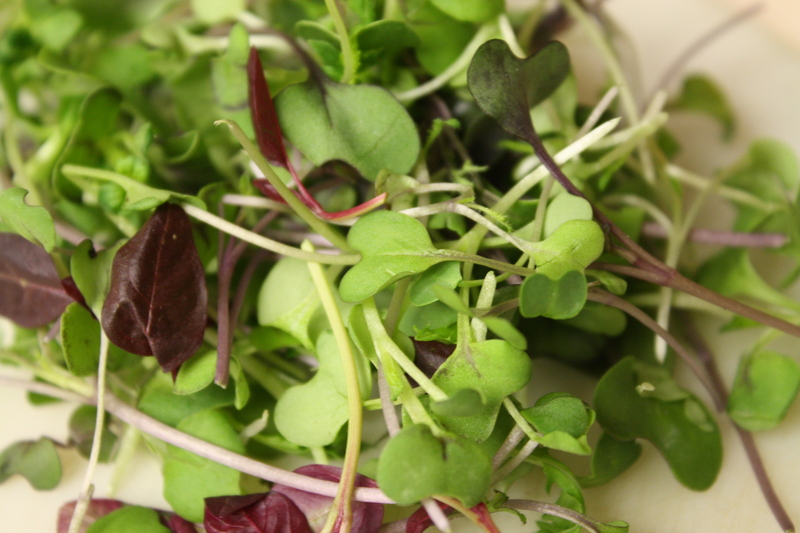 It is rich and feels very decadent, but super easy and inexpensive. This would be great for a dinner party, it would take you away from your guests for only about ten minutes! So Valentine’s Day happened! When I wasn’t pouring wine like a crazy person at Villicana for the Far Out Wineries Passport Weekend, I played house with my Valentine. We lounged around on the couch, watched Olympics, drank lots of wine, and snugged the dog. It was perfect. Tim and I didn’t want to do the whole spend-lots-of-money-on-dinner thing and roses weren’t allowed; instead, we opted for dinner at home, complete with port and cheesecake for dessert (Tim surprised me with Four Vines Zin Port and Riedel port glasses! So thoughtful!). Old Bay was the favor at my cousin's Baltimore wedding! So cute! 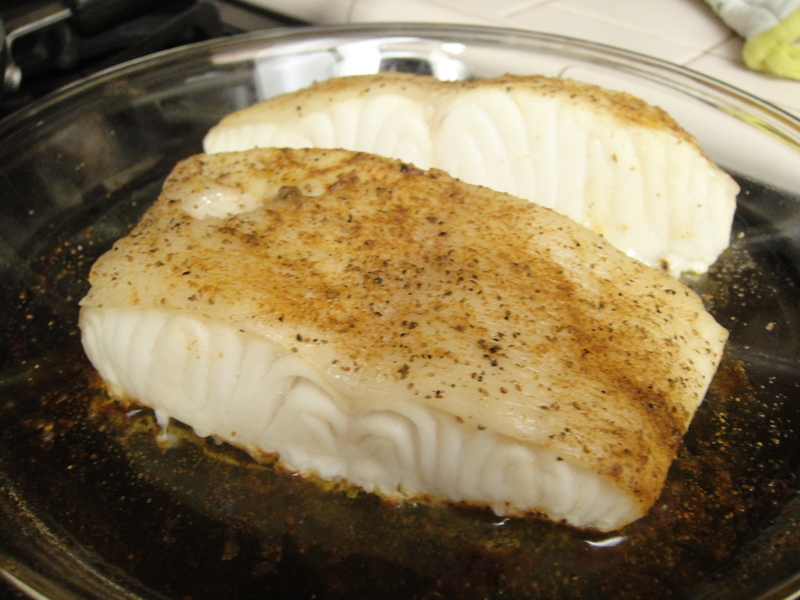 On Saturday, we visited Pier 46 for some Chilean Sea Bass, one of Tim’s favorites. 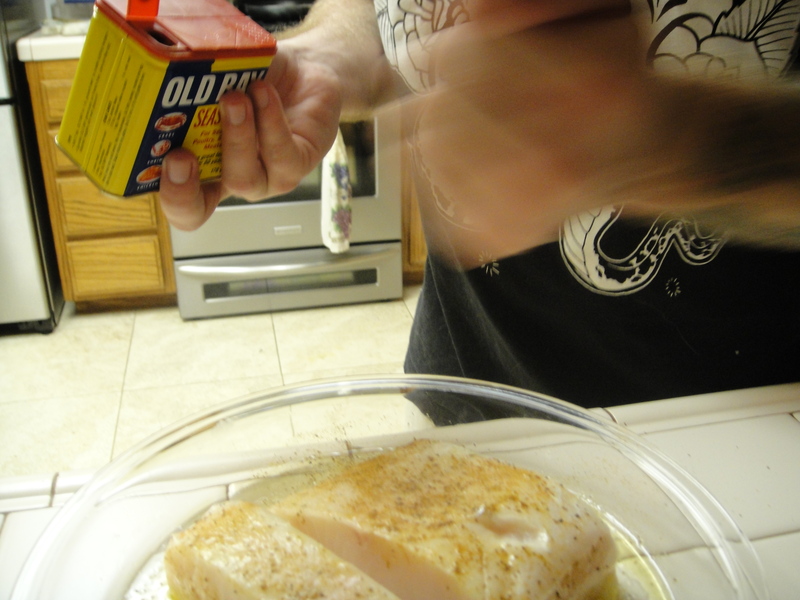 He baked it with salt, pepper, Old Bay Seasoning, and a little olive oil. 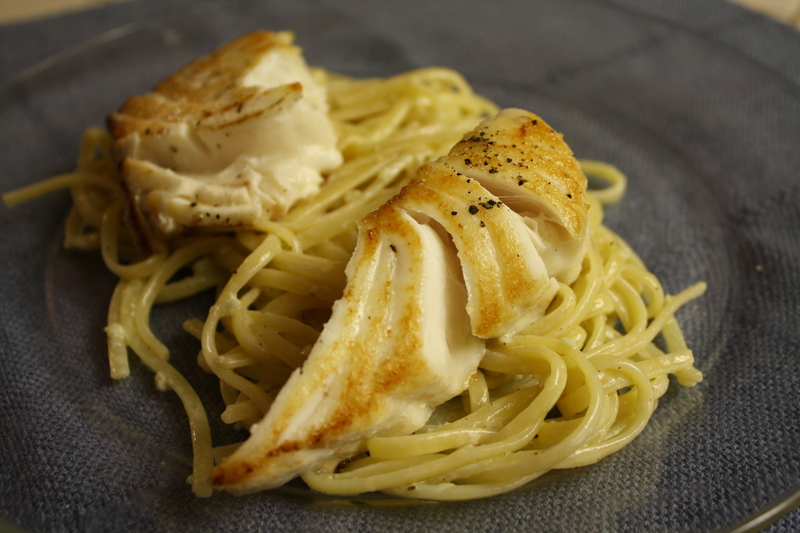 It was delicious, I loved how the fish came apart like dominoes. Disclaimer: I didn’t know Chilean Sea Bass is endangered! I won’t be buying it again until the population recovers, but I am glad I tried it.